We had friends who had just moved out to Gibraltar and thought this would be an excellent opportunity to check out this small British overseas territory that is not part of the European Community. 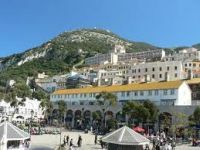 Indeed British is the only way to describe Gibraltar as it seemed more British than multi-cultural diverse Britain; it has one main high street with no empty units (the out of town outlet stores are in Spain – it is an inconvenience to shop across the border. Since few Gibraltarians have a car one needs to hire on the other side and then carry the purchases across the border, or drive through and then return the vehicle. Crime rates are low and Gibraltarians were very friendly and made us feel most welcome to what for practical purposes is an island with a causeway. What to wear? The weather never drops below 60°F or goes much over 80°F. We give these details in the traditional style, which sums up Gibraltar. The weather too is very British. Rain in the winter and mostly sun in the summer. Gibraltar was ceded to Britain "in perpetuity" under the Treaty of Utrecht in 1713. Gibraltarians rejected proposals for Spanish sovereignty in a 1967 referendum and again in 2002. 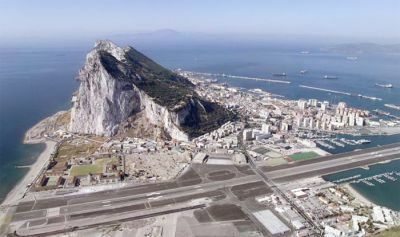 Under the Gibraltar constitution of 2006, Gibraltar governs its own affairs, though some powers, such as defence and foreign relations, remain the responsibility of the UK Government. Spain blows hot and cold regarding the territory. Whilst the airport, which sits on reclaimed land, is supposed to operate in a similar manner to Basle with dual exit, and a new terminal has been built, the way out to Spain is made difficult and the border crossing can be protracted. Spain is the loser as it could do further business with the Gibraltar community and in terms of tourism. From London getting to Gibraltar by air is very easy with British Airways offering a daily service from Heathrow, easyJet at Gatwick and Monarch coming in from Luton. EasyJet provides services from Liverpool whilst Manchester is Monarch’s northern gateway. bmibaby flies from East Midlands. Several years back flights from Gibraltar to Madrid were launched by both BA and Iberia but they proved unviable. Cruise ships are now a steady business with the town square an easy walk from the terminal. Even here, from time to time, Spain can make life difficult, occasionally finding a reason to ban ships from Spanish ports that have visited the enclave. 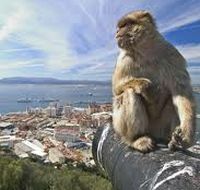 Gibraltar is a fine place for a long weekend type break or two-day stop, part of a longer tour of Spain or Morocco. It is in total 2.4 sq miles in area with 30,000 permanent inhabitants. Activities are limited. But those one or two days can be jam packed. A trip to the Upper Rock is a must. On the Rock are the amazing defensive tunnels, further strengthened in 1940 when Winston Churchill believed that an attack on Gibraltar was imminent. The Fascist dictator Franco proved pragmatic and desisted. Also on the Rock are the famous rock apes which will be amazing for those children not scared by animals. 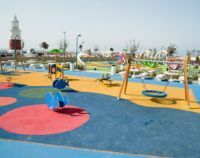 Finally there is Europa point – the southernmost tip of Europe with its breathtaking views across the Strait to North Africa – a recent addition, it now has a fantastic play park. Hotel selection is limited but we must mention The Rock, very colonial, overlooking the town; The O’Callaghan Eliott, central, and Caleta, Gibraltar’s only ‘beach hotel’. Without a young family, we might have ventured from Gibraltar to Morocco but instead we decided to go to Seville – a 2½-hour drive away. We opted for a self-catering villa. These are brilliant for holidays with kids – they usually come equipped with a washing machine, plenty of space for the kids to run around and a separate room for you to enjoy once the kids have gone to bed. 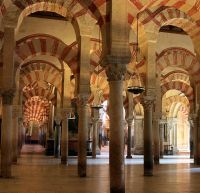 The history of Spain is fascinating, much under the influence of the Moors for 500 years until 1492 when both the Moslems and Jews were expelled followed by the Inquisition. Both have left their mark all around the Iberian peninsula particularly in the south west. For the Jewish tourist it was fascinating and slightly unsettling to visit Seville’s Jewish quarter. The church of Saint Bartholomew was originally built as a synagogue 800 years ago. We also went to Cordova, where famous doctor and scholar Maimonides was born in 1135. Again apart from the old synagogue, statute of Maimonides and the Jewish museum there were no obvious traces of Jewish life. Today Spain has a small but vibrant Jewish community and recognises Israel. 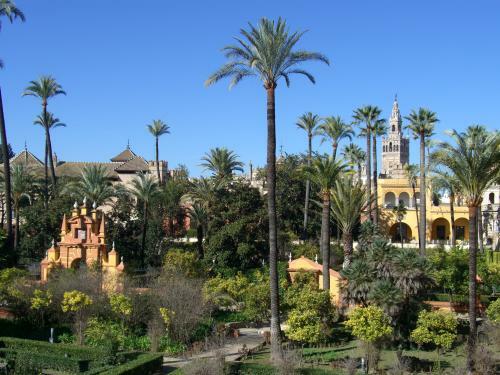 As for the rest of Seville, Alcazar, a Moorish palace, was the main attraction – it was indeed pretty enough if you like that kind of thing. Another tourist favourite is the Isla Magica theme park – but look at their website before a visit to find out when it is open. Seville is getting on for 150 miles north of Gibraltar but you can also stop in Cadiz either way, an interesting fortified port city with plenty of history.